Wide KB Support Tape is ideal for treating larger areas of the body, such as your Quads, Hamstrings, Shoulders, Back and more. Our Wide Tape is 3 inches wide, compared to our regular tape which is 2 inches wide. This means the Wide Tape will cover more of the injured area, for even more support and protection. Just like our regular tape, the Wide version is designed to provide your injury with ongoing compression. This helps to relieve your swelling throughout the day. It also provides support and protection for your damaged tissue, helping to prevent re-injury. Use Wide Tape during physical activity or between your treatments with the BFST® and ColdCure® Wraps. 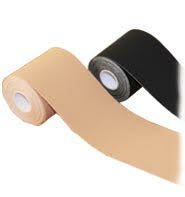 Wide KB Support Tape comes in a Continuous Roll and is available in both Black and Beige. Apply Wide Tape anywhere you have a soft tissue or repetitive strain injury. Our skin is normally soft and elastic, not offering much outside support for the tissue below. Wide KB Support Tape makes your skin much more rigid than usual when it's applied. This works to limit the movement of your skin, which helps protect the soft tissue below. It also reduces movement of the tissue itself, further preventing re-injury. Wide KB Support Tape works with your skin to create a rigid surface to support your tissue. This support is what you need to avoid re-injury and heal faster. Wide KB Support Tape isn't just for use between BFST® and ColdCure® treatments. You can wear it to work, at the gym, while you sleep, when you're doing housework, while you're running errands, etc. It's made of thin, breathable material to keep you moving and active all day long without restricting your range of motion. A single application of Wide KB Support Tape lasts all day, so you can wear it during all of your daily activities and it won't get in the way. Continuous Rolls allow you to get creative with the size and shape of your tape. Each box contains 1 Continuous Roll of Wide KB Support Tape that is 3 inches wide and 16 feet long. The Continuous Roll allows for more options when it comes to cutting your tape into various lengths and styles. The backing of the tape has a handy graph design that helps you cut it along the length or the width. It's extremely customizable. We always use the highest quality, safest materials we can to manufacture our products. That's why our KB Support Tape is latex-free, hypoallergenic and made with a medical adhesive. The safety and efficacy of our products is extremely important to us. We are always striving to improve our products to bring you the absolute best technology available. 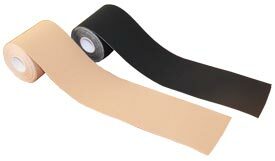 Note: Our 30 Day Money Back Guarantee does not apply to the Wide KB Support Tape, which is a final sale item.